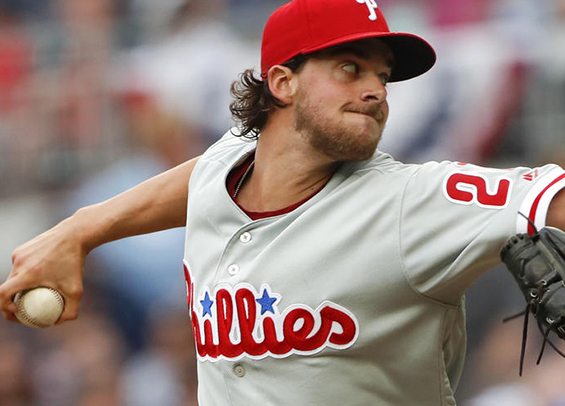 The Philadelphia Phillies and right-handed pitcher Aaron Nola have agreed to a four-year, $45 million deal that includes a club option for a fifth season. The club announced the deal on Wednesday morning. The $45 million is guaranteed over four seasons with the fifth-year option carrying a price tag of $16 million. The deal also includes a signing bonus of $2 million. Nola and the Phillies were scheduled to have an arbitration hearing on Thursday. Nola had been seeking $6.75 million for 2019 while the Phillies had offered $4.5 million. Nola, 25, was an All-Star last season and a finalist in the Cy Young Award vote. He posted a 2.37 ERA with 224 strikeouts through 212.1 innings of work. Over the last two years, Nola has made a name for himself as one of the game's best young arms. He's started 60 games over that span, going 29-17 with a 2.89 ERA and 408 strikeouts.